With those chilling words, Blue is caught up in a mystery she never expected involving the privileged Raven Boys from Aglionby Academy. She must guard her heart closely, however, because Blue’s always been told that she’s destined to kill her true love with a kiss. If Edgar Allan Poe had taught the boys of Dead Poets Society, The Raven Boys is the type of tale he might’ve told, one that emerges through curl of smoke and excites with a flash of fire. This story, which seems to be loosely based on a real Welsh folk tale, is haunted by ghosts, invigorated by a fantastical search for a legendary sleeping Welsh king, and tinged with the frightening dark beauty of centuries-old magic. While the story starts out from Blue’s point of view, the book is actually told in third-party omniscient style, a welcome change from the author’s usual first person perspective, and a necessary one given the many characters we get to know, particularly the raven boys. Gansey, who is obsessed with the supernatural; Adam, who yearns for a life outside what he knows; Ronan, whose anger hides untold regret; and Noah, a troubled soul who knows a great deal more than he lets on. I loved the complicated relationship between these boys, from their good-natured jeers to their anxious concern for one another. There is a collegial feel to the book that I very much enjoyed, but beyond that, there is also a deeply felt connection and a mysterious synergy between the characters that I hadn’t felt in the author’s books since Shiver and Linger. It’s a surprise to find that the strongest and most compelling facet of this novel isn’t necessarily the romance–although that is also intriguing and incredibly complicated–but the brotherly love between this tightly-knit group of boys. There are several mysteries going on, all of which aroused my curiosity. I have to admit, however, there are so many characters and plot lines to keep track of that the first half of the book was occasionally bewildering and a little maddening. As with The Scorpio Races, I also find some of the names a bit distracting since there are so many unusual ones (although I do like some of them, including the rather gloriously pompous “Barrington Whelk”), and the propensity to overuse proper nouns when a simple “he” or “she” would do occasionally tried my patience. While I think the novel would be stronger overall if it was a little more focused and lost some of its cluttering details, these are small nitpicks in such an imaginative book, and the whirlwind of the second half definitely rewards those who stick with it. I liked that we see more of the author’s offbeat humor in this novel, and her gift for seeing beauty in ordinary things still moves me. I’m happy to find another Maggie Stiefvater book that I like so much and I’m incredibly excited to see where this story goes next. That cryptic ending–and the loose ends with Blue’s romantic destiny–will guarantee that I’ll be one of the first people in line for the sequel. We know we’ve been spoiling our readers with giveaways recently, but there are a ton of great books releasing this fall! Thanks to our friends at Scholastic Books, we’re offering you a chance to win a copy of Maggie’s latest book. As usual, all you have to do is leave your contact details through the Rafflecopter form along with a comment below! This contest is open to internationally to readers aged 18 and up. If you’d like to sample the novel, you may also read the first two chapters on Entertainment Weekly! Loved your review as usual Wendy. As I have read all of Maggie’s books and really enjoyed the Raven Boys, Im looking forward to this follow up. Many Thanks for all the review you post, because of your recommendations I have just finished The Snow Child (which was wonderful) and I am about to start The Sea of Tranquility. Any ideas if you will be getting an ARC for The World After by Susan Ee to review soon? I LOVED the Wolves of Mercy Falls series, and I think Maggie’s writing is amazing. This book seems really promising! I’ve never read any book from her, but I know she’s a great writer, all I read or heard about her books are amazing things. I’m so excited to read something about her! I have heard a number of great things about this book. I am so excited to check it out. This many people can’t be wrong. Wendy, I love your reviews. They have steered me to so many great reads. This one looks like it’s right up my alley and I can’t wait to read it! Wendy, I love your reviews! They have steered me to so many wonderful books and this one seems like no exception. Believe it or not, I haven’t read one of Maggie’s books yet. This one looks right up my alley! She’s one of the BEST AUTHORS EVER. She wrote it. That’s all I need to know! This book is hands-down my favorite YA book so far this year. I read the ARC and am dying to have my very own copy! I have yet to read any of Maggie’s books, but this book sounds absolutely delicious. I can’t wait to get my hands on it. Im excited to read this book because yor review ROCKED! I’ve heard lots about this book and The Scopio Races that has all been good, but I didn’t overly enjoy Shiver which was my last Maggie book. However, I’m very intruiged by everything about this book and it really does sound exciting with lots of mystery and ghostly tales, I think it could really be something to capture my attention. Well, I look forward to reading this even more now. I enjoyed this book, but there’s something holding me back. I can’t pinpoint it but I just didn’t connect as much as I had hoped. Hopefully the next books will be better. I still loved the writing but it didn’t seem to ‘flow’ as easily as it has in the past for Maggie. I don’t know…. Great review! I’m really looking forward to this one. Pretty much anything Maggie touches is gold! You should check out The Curiosities if you haven’t seen it already (my review is at http://www.thenextreadya.wordpress.com). I really enjoyed Maggie’s Shiver series. There was something so tender & so touching between the two. It’s the type of relationship you don’t find very often, in prose or in real life. It’s what has me coming back for more, BUT having read your review, this sounds absolutely captivating!! This book seems interesting! I liked Scorpio Races, so I’m hoping this one will be just as great. I’ve loved everything Maggie has written and she seems so nice. I can’t wait to read this book. The cover is so intriguing! I am really very excited to read this book. I’m really looking forward to reading this! I read the first two chapters on her website and I’m so excited to read the rest! I am so excited to read this book! She is a great writer and has such interesting story lines! I’m really looking forard to reading The Raven Boys.It sounds really great and I enjoyed reading the Wolves of Mercy Fall’s series. Thanks for the chance to win! I see many positive reviews on this book, and I find its plot interesting. I’m hoping to read it someday. Excited about The Raven Boys. :) Thanks for the giveaway! I love the idea of a bunch of boys creepier than the dreamy (and creepy) boys of Dead Poets! I can’t wait to read this! I love the sound of this, and can’t wait to read it, even though I am overwhelmed with incomplete series right now! Wow, this sounds really good! I’ve only ever read Shiver by this author, but I loved it! Now I need to get my hands on this one! Can’t wait! I love Maggie Stiefvater’s writing. Great review! I’m anxiously awaiting this book now! A wonderful review Wendy! I haven’t read anything by Maggie Stiefvater but have seen so much praise for The Raven Boys I can’t wait to read it. A wonderful review Wendy! I haven’t read anything by Stiefvater as yet but have seen so much praise for The Raven Boys that I can’t wait to get hold of it. Thankyou for sharing & for the giveaway! This book seems amazing! Thank you for the giveaway! Read the preview for this and I’m salivating. I need to read this! Thanks for the chance to win this! I love Maggie. I just love her writing style, and her characters are so real, I feel like I know them. With the exception of the Shiver series, which was good just not for me, I have loved everything she has written. The Raven Boys is definitely the one that has me the most excited though. Thanks for the chance to win a copy! Wasnt the biggest fan of Mercy Falls, but loved Scorpio Races and happy to see the good stuff keeps coming. Excited to read this. I was simply taken by this quote: “Blue herself is startled by the sad, desperate sight of a boy named Gansey falling to his knees before her.” I love the idea of the paranormal and the surrender of the boy…and to think it’s either because Blue is his true love or his killer…or both? INTRIGUING! I would love a copy!! Thanks so much! Ive never read any of Maggie’s books before, but I’ve heard absolutely awesome things about them. This sounds like it might be perfect! I love the sound of it and it seems like something I’d love. Excellent review! I have never read a Stiefvater book before, but I’ve heard a lot about it (eg. The Scorpio Races) so I’m really curious about her potential! Also, The Raven Boys sounds really interesting :D completely different from your average YA book, which is just what I need! Oh, Wendy. You wonderfully evil woman. I don’t need any more books to read but I LOVE Maggie Stiefvater!! The tagline for this book–either your true love or you killed him–makes me want to pick it up asap! Holy cow, there are a bajillion comments on this. Anyway, I’m really glad you liked it. Stiefvater books are so divisive. People tend to have such strong opinions about her works. I picked up an ARC of this, which I’ve obviously failed to read before release. (Bad blogger!) Since I haven’t loved her in the past, I’m skeptical. The change from first person to third sounds rather encouraging, since my big issue with her in the past has been my distaste for her characters, so perhaps some distance will be a good thing. The romances, too, have been problematic, mostly because I don’t like the characters and don’t care if they’re happy, so I’m a bit more hopeful knowing that the romantic element is significantly reduced. Also, there should be more books about friendship! I have to say, I have been hesitant to read this, and I’m honestly not sure if your review swayed me in one direction or another,, but since you mention that you haven’t enjoyed a Stievater book as much since Shiver,,, I think I must try it out! I read the Wolves of Mercy Falls series and loved it and have heard nothing but good things about this book. I am excited to get my hands on this one. Her take on werewolves was so different that I am really looking forward to see what she does with this book. I’m really excited to read this book or Stiefvater books cause I always read a lot of praises for her books… I never had the chance to read her books, that’s why I’m really thankful for this giveaway!!! This sounds like a book I would love. Thanks for the review! Wonderful review, Wendy! I am so excited for this book and I am thrilled that you have enjoyed it! I haven’t read any of Maggie Stiefvater’s books before but I’m looking forward to reading this one because I’ve heard good things about it. I have so many friends that love Stiefvater, but she’s just not won me over yet. Shiver was alright, Linger was better, and The Scorpio Races was a “maybe later” book for me. Sure her writing is beautiful and her world-building is A-Plus, but I haven’t been drawn in. I think this book may be the one for me if I’m going to like her stuff. This is… EVERYTHING I was hoping for. I’ve read a few mixed reviews, but I had wondered if it was because many were expecting something this book was not, something I was hoping it would be. What you’ve described is… oh perfect. The bond between the boys, the myth, the ancient, old magic. I can’t even. Your review = perfection. And I hope you don’t take it the wrong way when I tell you I want to eat your brain. But in a Sylar from Heroes I want your superpowers kind of way, not an omnomnomnom braaaaains and I’m a zombie kind of way. I’ve been really excited by the reviews for this book. The Scorpio Races was a little slow for my taste but I remain enamored with Stiefvater’s magical writing and world-creating abilities so I hope to love this one. This sounds great! I didn’t really like the Shiver series (though I may have been in a pissy mood when I tried to read it) but I loved Scorpio Races. This sounds so atmospheric–I remember being completely caught up in Scorpio Races. I felt like I was there. …although maybe I need to wait until the series is finished to start this. If I love it, waiting is going to be hard. I love the sound of this book! I’m all about complicated characters and their relationships in stories, so I can’t wait to read about Blue and her Raven Boys. I also am very intrigued about the Welsh mythology inspiration, although admittedly I don’t know anything about Welsh folklore. Maybe this will inspire me to learn some more, and it’s definitely something I’ll have to look into as I read this book. Lovely review and thanks for holding a giveaway! I was intrigued by the Wolves of Mercy Falls trilogy, and hooked by The Scorpio Races. There’s no doubt I’ll love The Raven Boys and I’m looking forward to seeing where MS takes us in this new world of hers. Honestly, I still can’t get Sean Kendrick out of my head. His character is what made me love TSR. I know MS has it in her to make me just as enthralled with any other characters she dreams up. Love your review and I do look forward to reading this one. 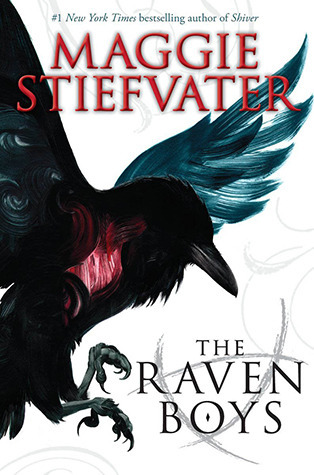 I have yet to read one of Ms. Stiefvater’s works, though I’ve been interested in doing so for quite some time. She appears to be quite the polarizing author – from what I’ve seen on Goodreads, people either adore or loathe her books. It’s especially interesting to see how wide-ranging reaction to her Wolves of Mercy Falls trilogy is. I’m looking forward to this one! I have heard nothing but good things about The Raven Boys and from everything I’ve read about it the book is wonderful. I would love to win it! i’m excited b/c of all the buzz!! thank you for the contest! I was stunned by how much I loved The Scorpio Races — I didn’t want i to end! And can’t wait to try this one! The synopsis sounds very intriguing! I did not finish reading her Shiver series. It rather bored me. However, this sounds much more interesting and exciting!! I’ve read all of Maggie’s books so far, and while I didn’t think Scorpio Races was as good as it could have been, I am really excited about this one. I can’t wait until it’s published! I loved reading her Mercy Falls series and this seems like a good series. I’ve never read a book by Maggie Stiefvater. I’ve always been interested in them, but never got around to it. This one though, this book seems different. I just added it to the very very top of my to read list! I love her Wovles of Mercy Falls series. I haven’t read any book by her but heard good things, so I’m curious to read it..
really curious about this author, haven’t read anything by her yet. I really enjoyed reading the Shiver series and have heard some amazing things about this book. Thanks for the chance to win! I loved Stiefvater’s writing in The Scorpio Races so much that it’s one of my favorite books I’ve read this year. I’m hoping that this book will be the same. I actually read Shiver and Linger as well, and while Shiver was good (but not a favorite), Linger really let me down. So I’m hoping for the best here since I can’t really say how I feel about Stiefvater yet. I’m such a fan of Maggie’s books, and I’m so excited to read this one. I had the same thing with Scorpio Races, started a little confusing, then the story took hold of me. I loved Maggie’s writing in The Wolves of Mercy Falls and have no doubt that I will love it in The Raven Boys as well! She is fantastic and her writing drawls you in from the first page. I’ve been waiting for this book for ages! Every time I hear someone talk about it I get excited again. It doesn’t help that everyone I know says it’s great! I read Maggie’s Wolves of Mercy Fall’s and adored them. I have no doubt that I will love her writing in The Raven Boys as well! She is a fantastic writer that drawls you in from the first page! Wendy, I love it! If Poe had taught the boys of the Dead Poet’s Society? Um…yeah, I’ll read that book. I love that this is a story that highlights brotherly relationships as there really aren’t enough male-centric YA books out there, and I’m so happy that you found another Stiefvater that you can love as much as Shiver (I know you weren’t a fan of TSR). As much as I want to read this one, I think I’m going to steer clear until the series is complete so that I can plow through them happily. I actually never read any of Maggie’s writing, but I wanted to for so long. The summaries for her other books just never captured me enough, but I know of so many of my friends who adore her to little bits. But when I read the summary for THIS book, I was insanely interested. Then, I saw it was by Maggie, and I was so very pleased. I knew that I’d read this book, and that it’ll be my introduction to Maggie’s books. I also knew that if I liked this one as much as I thought I will, I’ll forever be Maggie’s fan, so I’m really looking forward to reading it! I don’t live where I can buy her books (unless online), but I knew straight away I’d get my hand on this one… somehow. So I really love the idea of this giveaway! Thank you so much for hosting it! I haven’t read any book my Maggie but I heard such good things about this that I really want to pick it up. I have not ready any of Maggie’s book and I really want to read this. It sounds so interesting and I have heard good things about it. The only books of hers I’ve read is The Scorpio Races, and it was pretty great. This one sounds really interesting too! Can’t wait to read it. The only one of her books I’ve read before is The Scorpio Races, and it was pretty great. This sounds really interesting, too! Can’t wait to read it! I’m not sure if my first comment went through unfortunately, but I swear I’m not spamming you! The first thing that struck me about Raven Boys is actually the title and of course the beautiful book cover. As you said Wendy it seems to have a very Edgar Allen Poe feel to it which is fantastic because I think it could be a great Halloween read :). Also this is a great review and I really enjoyed your review of David Levithan’s Every Day :). I have to admit that it was the name of the book that caught my attention and the gorgeous cover. After seeing the book trailer for it I’m intrigued. And like you said Wendy it kind of has an Edgar Allen Poe feeling to it. I’ve never read Stiefvater’s books before, but this is definitely one that I would like to read. It seems like it can be a good Halloween read :). This is a wonderful review Wendy and I really enjoyed your review of David Levithan’s Every Day as well! From the minute I heard about this book I was interested. It’s not like other books I’ve read, and I was excited to see what Stiefvater did with the concept. I’ve read Shiver before, and loved her writing, so I became even more excited for this book. I want to see what happens to this Blue character. Love the review Wendy and thanks for hosting the giveaway. Eww stories about the dead, spirits and a mystery. Sounds really intriguing. Thanks for posting the giveaway. I’ve heard do many things about this book and I would love to read it. I love Maggie’s books for the gorgeous and poetic writing! Ballad and Lament are my favorites, and I can’t wait to read her new one! I love Maggie’s books mostly for the gorgeous and poetic writing! Ballad and Lament are my favorites, and I’m really excited to read this one! The concept of The Raven Boys is really fresh and intriguing. And I’d like the opportunity to enjoy is as much as you have. I have recently read the Wolves of Mercy Falls series. I loved her storytelling! The concept and characters were fantastic! I haven’t read The Scorpio Races yet, but The Raven Boys has been on my radar for a while. It sounds like it is going to be amazing! I can’t lie – I had a *very* difficult time finishing THE SCORPIO RACES. It never grabbed me, I never though the characters’ interactions moved beyond stilted, and really, I was just all around disappointed. Oh, I so want to win this. I have yet to read any of Maggie Stiefvater’s books but this synopsis sounded really interesting to me. This book really excites me! It sounds like such a great story! Thanks for the giveaway! thanks for a great post and giveaway! I haven’t read any of Maggie’s books yet and I know they come highly recommended! Omg! So excited, can’t wait for it to come out! Omg! So excited! Can’t wait for it to come out! Can’t wait to read this it sounds so good! Can’t wait to read this it sounds so good!!! LOL! So many blog I visited so far really like The Raven Boys so far. And their reviews went up today! I think your the third blog I stop by that have their review up today. Awesome review! I really loved the story and the magic behind it. I’m excited to see what happens next. I haven’t had the opportunity to read any of Maggie’s books yet but this one has been on my to-read list for a while. The reviews have been great. Thanks for the giveaway. What do I like about Maggie’s writing?? I think the question is what don’t I like? Ever since Shiver I’ve loved her writing style. It’s just so dreamy and beautiful. She really knows how to set a scene. I like to think of Maggie as the equivalent of an indie/folk rocker. I really love Maggie’s books, can’t wait to read this one! I know I’m in the minority, but I really enjoyed The Scorpio Races. I listened to the audio, though, and I think the inclusion of Maggie’s own music and the accented narration really set the tone for the novel. But it’s her writing that really does me in…so lyrical and beautiful. I completely agree with your assessment that she is able to see the beauty in even the most mundane things. I’ve been slightly avoiding this one, but after reading your review I may have to pick it up. Thanks, Wendy! Oh, I’m so excited to read the book because of your review! Thanks for the giveaway! I enjoyed so much in The Wolves of Mercy Falls trilogy! It’s beautifully written. So I would really love to read The Raven Boys! I only have read the first two books in her previous series & I loved them. Shiver was one of my favourites! ;) I really want to read this book. A lot of people seem to adore it and I’m curious about it. ;) Awesome giveaway! Maggie Stiefvater is one of my favorite authors. I love the way she writes and her characters are very beautiful. I can’t wait to read The Raven Boys. I have been reading a TON of reviews of The Raven Boys because I read it 2 weeks ago and LOVED IT and wanted to read other people’s opinions. I am so glad you enjoyed it! I also had a bit of issue with the weird names but Gansey is a great one! and like you said, I also LOVED the brotherly love between the four boys! I haven’t read this book yet, but as soon as I learned that it is going to be made into a movie I decided I must read it! I loved Shiver and Lament!! and I’m looking forward to read the next books!! I didn’t particularly enjoy Shiver, but this book sounds much more interesting! I would be willing to give it a chance. Thanks for the review! I enjoyed the Wolves of Mercy Falls series and I can’t wait to read more from Ms. Stiefvater! I’m so excited for this! The Scorpio Races was so fantastic, I can’t wait to see what she does with this series. I’m so excited for this novel! The Scorpio Races was so fantastic, I can’t wait what she does with a new series. I’ve heard nothing but good things about this one . I really like the synopsis and I love the cover! (Yes I judge a book by its cover lol) Thanks for the giveaway! Although I always have trouble spelling Maggie’s last name, I’m always a big fan of her writing. She is such a poetic writer! I have not read any of her books yet but out of all of them I am most excited for this one. I assassin soOoooo bad! Your review on Goodreads caught my eye; looks like a good story! I have been waiting to read this book. I’ve never read one of Maggie Steifvater’s books before but this one caught my eye months ago I was intrigued by the premise of these mysterious boys and the idea of her seeing a vision of someone and not knowing why. After reading this review I really cannot wait to read it! I am so unbelievably excited for this! You’re killing me a little bit with the review, but in a good way. :) Great review and thanks for the giveaway! I think Maggie S’s writing keeps getting better and better. After Scorpio Races I have been looking forward to this ever since I heard about it. YAY! I’m glad you enjoy this one. I’m currently reading it and its a bit slow. I hope it picks up soon. I DNF Scorpio Races so I hope this one proves to be better :) thanks Wendy for your great review! I’ve never read a Stiefvater book yet, but no one can stop talking about her and her books, so I’m excited to try one! I’ve only ever read Stiefvater’s Scorpio Races, though her Mercy Falls series is definitely on my to-read list. I thought Scorpio was phenomenal, though, so I’m really excited for Raven Boys! I’ve only ever read Stiefvater’s “Scorpio Races,” though her “Mercy Falls” books are definitely on my to-read list. “Scorpio” was so phenomenal, though, I am really excited for the “Raven Boys” series!! I loved Scorpio Races, it was imaginative and enchanting. Can’t wait to read this! I really want to know more about Blue and the mystery with that boy! I really want to hear about Blue and what happens with that boy! I haven’t actually read any of her previous works before, but the description of this novel just grabbed my attention! I’m eager to read about the Welsh legend that you say the book is based on, plus all the supernatural/magical elements. Plus, the romance aspect can’t hurt! The brotherly love? Wow. Cool. Thanks for sharing that insight. I was a huge fan of the Shiver series from Maggie and am looking forward to reading other stories from her. Thank you for this review! this could be my first Maggie Stiefvater’s novel! I love Maggie Stiefvater! I’m really looking forward to this and glad you enjoyed it. I prefer first person but with a lot of characters to get to know it is understandable why it is third person. I just find it harder to connect with a character in third person. A fate to kill your true love with a kiss sounds devastating! I love mystery and fantasy so this should be good for me. WOW this book sounds dark and dreamy, plus I could pass it on to my daughter, she likes this kind of book too. I’m not familiar with the author, but this sounds like a good book. It’s definitely going on my books to reas list. Thanks for the giveaway! I’ve had my eye on this one since its announcement! Thanks for the thoughtful review (which definitely piques my interest) and the giveaway. I reallly want to read The Raven Boys, its sound very interesting!…Hope to win and thanks for the giveaway! I really want to read The Raven Boys, its sound very interesting!…Hope to win and thanks for the giveaway! I loved Scorpio Races, it was so different from her other books yet still captured your imagination. Can’t wait to read this! I haven’t read any book by Maggie Stiefvater yet, but this one sounds really interesting. I’m adding it to my TBR list. I love the different topics Maggie picks for her books. I’m so excited to read this. With Maggie Stiefvater I’m never shocked anymore. Mercy Falls was incredible but with a Scorpio Races follow up it shows that she’ll always have more to come. Maggie never ceases to amaze me! I love her writing <3 Thank you for the opportunity to win!